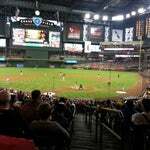 Formerly known as Bank One Ballpark, Chase Field is a 49,000 seat natural turf baseball stadium. 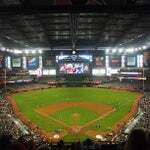 Home of the MLB Arizona Diamondbacks and host to several other events in the off-season. Who splashed the first-ever home run in the pool? None other than D-backs legend Mark Grace on 5/12/98. 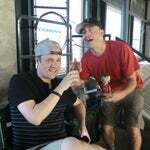 BUT, he hit it as a member of the Chicago Cubs. 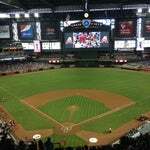 It costs just $2 worth of electricity to open or close the 9-million pound roof at Chase Field. 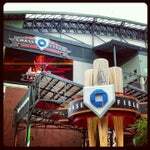 Home of the 2011 All Star Game! Stop by the Pepsi MAX Field of Dreams at Fan Fest and keep an eye out for Summertime Santa in the pool. 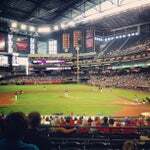 Sure, we've all been at a ball game, and thought "Man, I wish I was sitting in a pool." 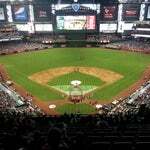 You can actually do that here.�For $3,500 or so, rent the pool in the outfield for up to 35 people. 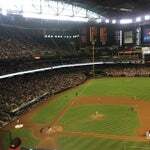 Did you know that Chase Field was the first stadium built in the United States with a retractable roof? Imagine having this in your living room? 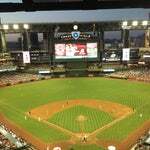 Chase Field�s high-def LED board is 136 ft x 46 ft with 880 native lines of resolution and screens video in up to 4.4 trillion colors! Tickets here are fairly inexpensive. 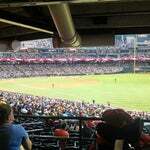 If you're buying walk up tickets, spring for the good seats. Join Chevy at the 2011 MLB All-Star Weekend (July 8-12) with cool events like Fan Fest, the Chevrolet All-Star Red Carpet Show and of course the All-Star Game. Chevy giveaways all week long! 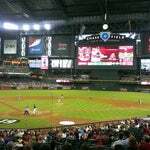 Don�t forget to use MLB.com At Bat on your Android, iPhone, iPad or iPod, BlackBerry or Windows 7 device to follow all the action on the field and around the league while you are at the park. 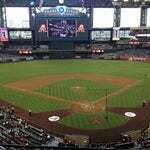 Welcome to Chase Field! 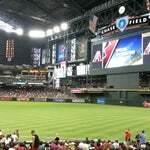 Check in using MLB.com At the Ballpark to unlock special offers and explore the stadium right from your phone. 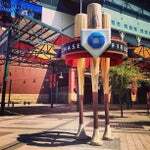 Get wasted before you come into the ballpark. I recommend Sliders, Coach & Willie's, or Cooperstown. 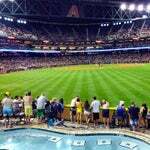 Take a dip in the pool, but be careful, it sits only 415 feet from home plate, so watch out for screaming baseballs. Always a good time! 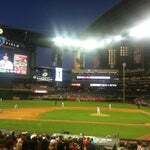 Yay Diamondbacks! 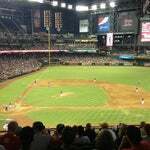 If you love baseball, this is the place to be! 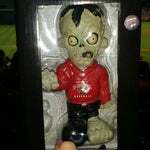 PLAY BALL! Bring your ticket stub to Half Moon Sports Grill after the game for 1/2 price burgers! 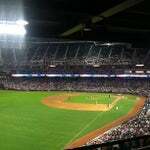 Best place to watch a baseball game. 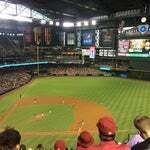 Best place to be to cheer on the DBacks! Ever wonder how long it takes to open and close the roof? With 4 miles of cable and two 200-horsepower motors, it only takes 4.5 minutes! Look up. That roof can be opened or closed to drop temperatures by 30�C. Alternatively you can cool off in the corner pool. That�s where home runs sometimes splash down. The pork mini chimis at Macayos are quite tasty.